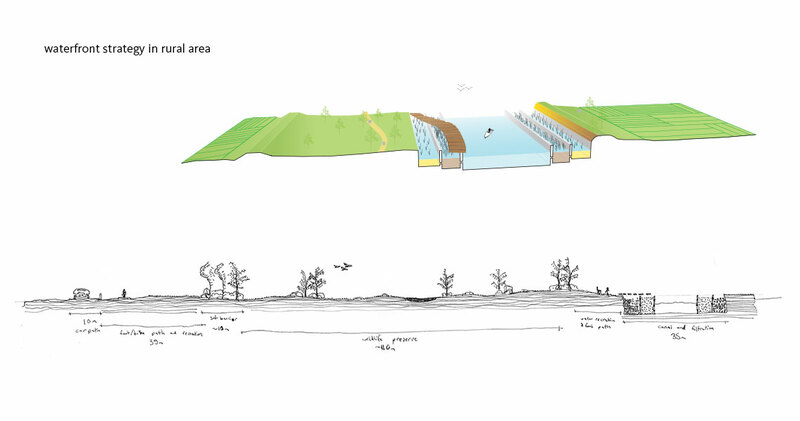 With a green cor­ri­dor along the Nan­pan River, it forms a double helix struc­ture — blue is the river and green is the nat­ural plan­ta­tion — an eco-gene, allows for the sustainable devel­op­ment of the Nan­pan River area. 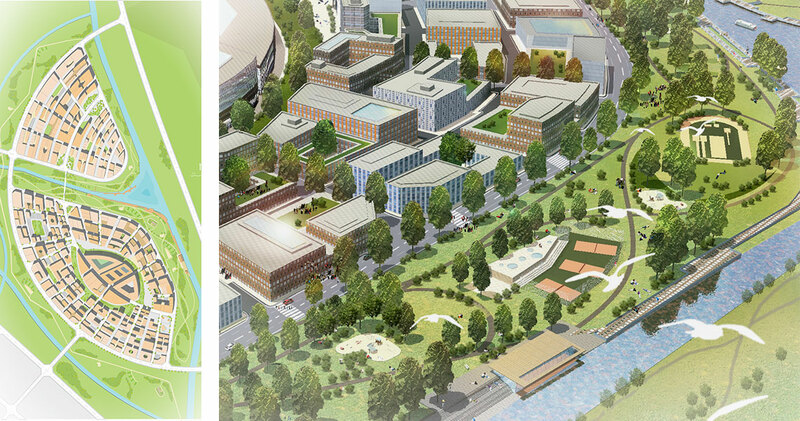 It integrates the urban fab­ric with the rural com­mu­ni­ties and the nat­ural land­scape. 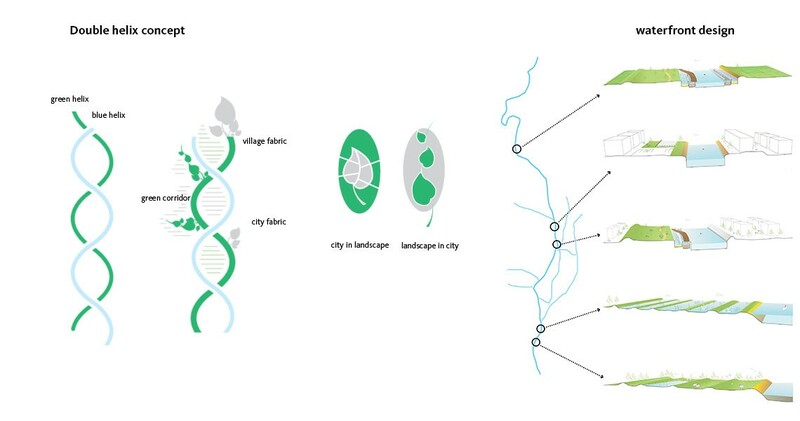 The four nodes are con­nected by this dou­ble helix struc­ture in order to form an eco­log­i­cal gar­den city brand about “moun­tain — water — land — for­est”. Two land­scape dom­i­nated node, the Jiu­long node and Spa node, mimic the devel­op­ment of rural dis­trict as the growth of leaves. The vines grow, as the main road con­nect­ing the development to exist­ing city fab­ric; two cities nodes. The ­green cor­ri­dor grows like a main vine through the city while con­nect­ing large pub­lic build­ings within the eco­log­i­cal corridors. The first step to pro­tect the ecosys­tem is to clean up the river. This includes hard tech­nol­ogy to begin fil­ter­ing the pol­lu­tants out of the water from the fac­to­ries. 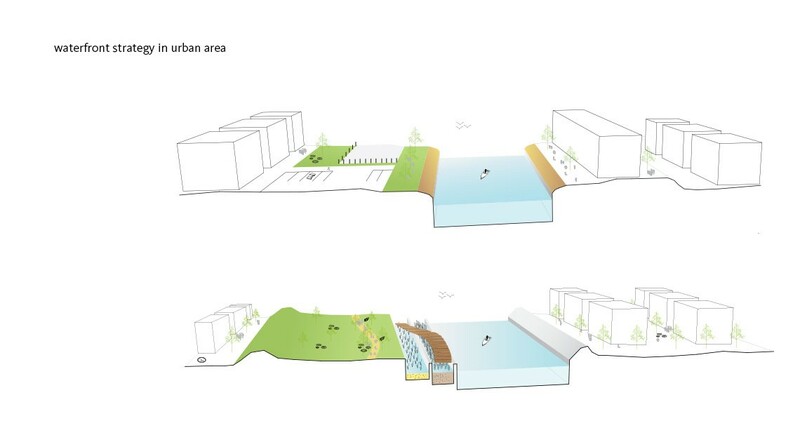 The next step is to begin build­ing the fil­tra­tion buffer zone along key areas of the river, starting near the city and work towards the south. It is impor­tant to plan zon­ing early for wildlife and wet­land reserves so plants and ani­mals have plenty of time to adapt and grow. By con­nect­ing these zones there will be greater access to vis­i­tors. It will also ensure vital components in the clean­ing process remain safe. Opti­mized aquapon­ics can be imple­mented for fish and plant farm­ing while puri­fy­ing the water. Intermediate spaces function as large long-term water fil­tra­tion and stor­age sys­tems. Additionally, they encourage local ani­mal and plant pop­u­la­tions to return to the envi­ron­ment. The mid­point of these cor­ri­dors will be devel­oped for relax­ation, leisure, infor­ma­tion, and food. The system will pro­vide room for plants and ani­mals to live between the points acces­si­ble to humans. Paths for walk­ing, bik­ing, relax­ation, and obser­va­tion mean­der­ through the cor­ri­dor. This is intended to intro­duce the vis­i­tor, or trav­eler, to the dif­fer­ent components of the sys­tem and surrounding area. By divid­ing the ecosys­tem devel­op­ment into subsequent phases, the system will have time to develop at a natural pace. Plants need time to mature and ani­mals need time to feel com­fort­able in their new loca­tion, and water needs time to be filtered. Phas­ing should be done in accor­dance with vil­lage urban­iza­tion. First allow­ing trans­porta­tion to hap­pen, then devel­op­ing the areas. It is important to create specialized zoning plans along the wa- terfront. This will ensure no unwanted expansion could take the area over. It is also important to enforce laws that protect these zoning plans. In this way when new interest is needed for revenue the parks and cooridor are already lush with plants and not barren. This will increase the value of property and attract investors. Once the plant, animal and fish life ecosystem spaces have been established and revenue is flowing into the city, a de- partment will need to be formed to maintain and monitor the health of these areas. This includes monitoring stations along the river for water pollution, excursions into wildlife zones to monitor breeding and animal activity, and observation of wet- land facilities for proper circulation and cleanliness. 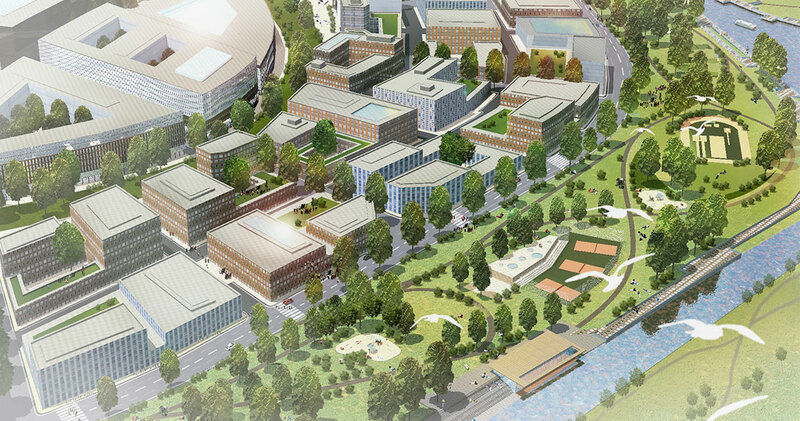 Node 3 design continues the design concept “green belt com- bined with large public buildings”. Green belt goes through the city fabric like vines, together with Nanpan river forming a double helix to create a unique urban space. Penetrating the city fabric with a green line, the green belt connects the most important public buildings such as a fitness center, a luxury hotel, an experience center, an international conference cen- ter, a shopping centers, several office buildings, etc. Urban landscape design features important public buildings and public spaces inside the green belt. the park along the river provides residents with a beautiful living environment. Citizens can enjoy walking on the boardwalk along the river. Tree line along the road is extended to the waterfront park. In this way the landscape and the city are closely linked together. We are eager to create a vibrant urban space learning from old city quarters that grow with time. Architects were invited to design special public buildings for a strong regional identity. We suggest a stone base and glass facade around the inner and outer courtyards of the public buildings. If you see from a higher point of view, you can see the green roof garden and terrace with different activities. Each building was designed by different architects under the guidance of the urban planning team. The meeting point of the Xiaoxiang River – Nanpan River is one of the important urban waterfront node in the plan. In this design, the concept of vine and leaves continues to be the dominate theme of the area, inside there are large entertain- ment and sport buildings such as shopping centers, cinemas, theaters, restaurants, etc. connected by main traffic system in the belt. There is a bike track linking inside the belt that al- lows for all public buildings with a seperate bike access. Green belt goes across the river, three major bridges on the river con- necting the north residence to the south public quarter. Two separate blocks west of plan are resort like leisure center with seperate road connecting them to the main road. The green- belt forms a loop to provide a better riding experience through the city. 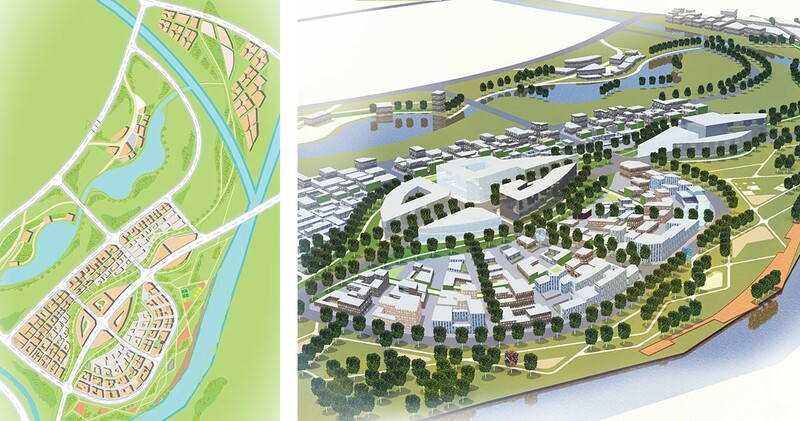 The design of spa village node (node 2) focuses on a variety of leaf-shaped communities scattered in a hilly area. Main street act as the main vine in the design, different communi- ties are connected by trails or lanes. Housing is located in the east stripe of the plot. The residence area consists of a mix of villas and apartment buildings. Together with the main road greenery and the Nanpan river, it forms a natural double helix to create a different environment for architecture and green space for residents. South of the hill is a rice terrace landscape theme park, in combination with education building and a sport center. Of- fice buildings are connected by the green vine together, the vine made it more accessible and convenient for visitors to ex- perience the landscape in every corner. The northern block is a leisure center located on a relatively flat terrain which also allows access to the waterfront activities. The mountain node design continues the concept of “natural double helix” design concept. The driveways and foot paths act like tree vines linking the theme villages together. Village is divided into several different themes and scattered in the mountain like leaves. On the mountain top a village of meditation with a tea house is planned providing visitors with excellent view overlook- ing the entire Jiulong Mountain area. A waterfront village is planned for water activities. Visitors can enjoy a variety of wa- ter sports here. Located in the middle of the valley there is an art village. Visitors can take part in various types of artistic activities and art-related a, films as well as a variety of leisure activities. South of the village there is a mountain-biking club. Starting from the village, a number of bike tracks around the Jiulong Mountain. Villages are interconnected by these tracks and act as a series of rest stops for bikers.